I pray you are having a blessed lent! Thank God, I am. It seems that the struggle has been proving to be a joy this year. With the blessing of His Grace Bishop Tikhon youth from our parish (St. Mary’s – Coaldale, PA) will be making these beautiful prayer stands to sell, raising money for mission trips for youth inour diocese, as well as trying to provide the unemployed young men in our area the ability to work with their hands and not be idle. 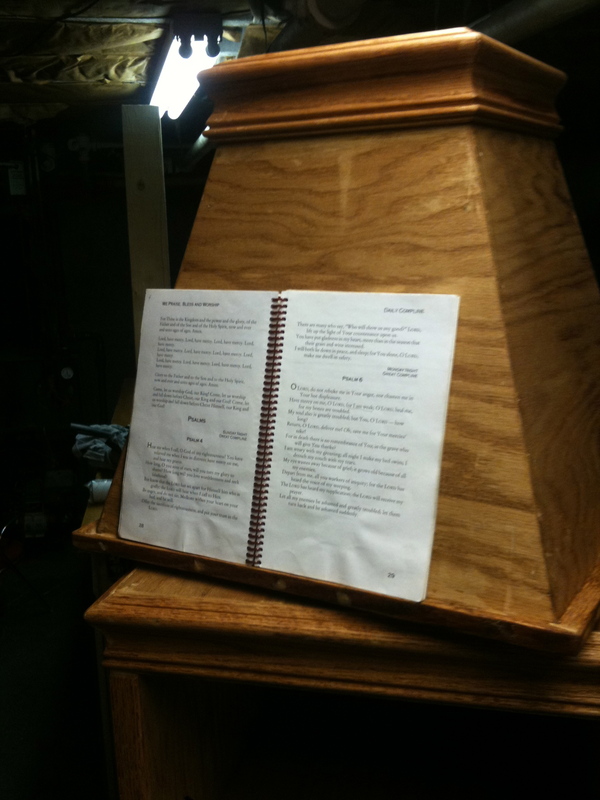 These stands will be made in a prayerful way, and are designed to be simple, yet very functional for parish or home use. The main body is made of 3/4″ Oak plywood with solid oak trim. It stands about 68″ high and is appox.16″ x 16″ wide and deep. The four sided top swivels 360* and has 3 storage shelves below. The stand is also on casters so it can be moved easily. I have provided pictures so you can see the “almost finished” demo model. It will also have a three bar cross on each side, although in the pictures they have not been attached yet. I can customize it if you like, although I am trying to keep a fairly standard sizing. I could make it shorter in height with ease, so that is not a problem. The one in the pictures is set with the book reading level falling at eye height for an average height person of 5′ 4″ to 6′ 1″. The stain in the photos is done in “Golden Oak”, but this could be any stain you would desire. The stand will also be varnished with a flat, satin or high gloss finish. If you are interested, we now taking orders now. Pricing will be $680.00 plus shipping. You can send me an email or call at 570-645-2772. Please forward this to anyone you know who might be interested in this stand.